We have been taking part in #SBS for over a year – not every week as it’s hard to keep that motivation going but as any small business will attest motivation and perseverance are key to your successes. 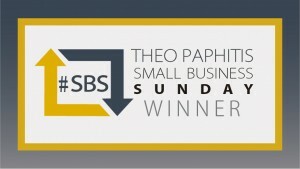 We are pleased to announce that on 30th December 2012 we became part of the elite family of SBS Winners. We get our own profile on Theo’s site and access to his knowledge and advice. I suspect that’s only the start of it! Within seconds our twitter feed went crazy and we are already booking in extra work for the New Year.